In 1990, I was invited by my vajra brother, Jim Casilio, to join a small group trek into the Solu-Khumbu region of Nepal on a pilgrimage to meet a 106-year-old Tibetan Lama, H.E. 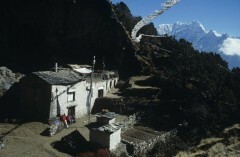 Kushok Mangden, Charok Rinpoche, a hermit who lived in a cave high in the Himalayas. Charok Rinpoche was the guiding teacher and root guru of a Sherpa friend, Lama Ngawang Tsultrim Zangpo, who served as our guide into the mountains to meet the venerable Rinpoche. As I walked along the path day after day, I contemplated what to ask this ancient holy person that would be of benefit not just to me, but to others as well. 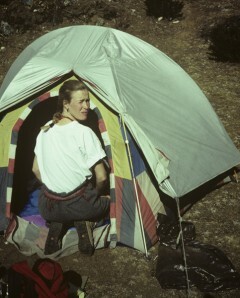 I had always felt a strong sense of connection to the Earth and deep concern about the poisoning of our planet. In Santa Fe, New Mexico where I live, we were beginning to face the problem of radioactive waste generated by the nuclear weapons industry at nearby Los Alamos National Laboratory. Joanna Macy and her work on Nuclear Guardianship had influenced me greatly and I wondered what we were to do with these toxic substances that will impact life on Earth for countless generations. Charok Rinpoche directed us to Thangboche Monastery on the route to Mt. Everest to have the vases made by the monks there. The Abbot, upon hearing of our request, was eager to help and enthusiastically pulled out his sacred relics to offer into the vases, as is the custom. But he and the other lamas were concerned about the safety of the vases traveling across the globe and the potential threat of them being opened by curious security officers or customs officials. For this reason, he chose to mix the most sacred substances, traditionally offered inside the vases, directly into the clay the pots were to be made from. They would then create, bless, consecrate, and empower the vases in ceremony and prepare them for us to fill, seal and bury ourselves. “No, no”, he said. “Just fill them and put them in the ground, they’ll do the work!” I could not believe it was as simple as that! He and Charok Rinpoche both gave us the same instruction, so it seemed the message was clear. In the months that followed, Lama Tsultrim collected many more sacred medicines and relics connected to every important lineage of the Vajrayana teachings back to Guru Rinpoche (Padmasambava) and Yeshe Tsogyal. He visited all of the greatest living teachers in Nepal who each offered precious medicines and substances that were gathered together and combined into the clay. 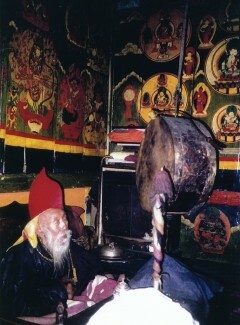 Lama Tsultrim then oversaw each step of the process and made sure they were blessed properly according to the tradition. They were made in Baktapur, outside of Kathmandu in a place blessed by the Dakini Yeshe Tsogyal when she stayed there on her first visit to Nepal from Tibet. 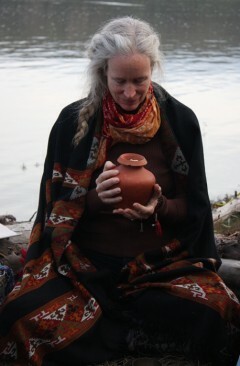 The next spring we received 30 consecrated clay pots, brought to us by dharma teacher and longtime friend Roshi Joan Halifax and my close friend, a pilgrimage guide, and artist, Colleen Kelley — both of who had been in Nepal. They carefully transported the vases back to New Mexico and delivered them to our practice community, Open Way Sangha in Santa Fe. For several years they sat in a trunk in my closet. I simply could not believe that all we had to do was fill them and put them in the ground! Eventually however, the Earth began to beg for us to bring them out and put them to work. Forest fires, drought, floods, wars, endless oppression and obvious signs of imbalance were occurring in every direction. We pulled the vases out of hiding and began the process of putting them into action. 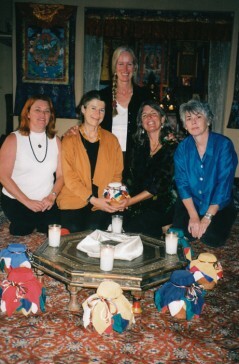 Every full moon, friends of Open Way Sangha gathered with the vases. We shared our sincere prayers, songs, and intentions that the balance and harmony of the Earth be restored. People brought offerings symbolic of healing and protection for the Earth to be placed in each of them. Some of the offerings were very traditional and some were not, but all of them were meaningful to those who offered them with a good heart and pure motivation. The legacy of nuclear weapons production and the resulting radioactive waste had been a strong motivating factor in my original request to Charok Rinpoche. As such, it soon became clear that the center of the mandala of our particular lineage of Earth Treasure Vases was a cave above Los Alamos National Laboratory, the birthplace of the atomic bomb. The vase we buried there was accomplished with the help of the Gyumed Monks from Dharamsala who performed ceremonies to insure that this vase did its job well. Tewa medicine woman Vickie Downey, who offered prayers and blessings on behalf of the local native Pueblo people whose land was taken to build the lab, also joined us. To build the Earth Treasure Vase mandala, we began by placing one vase in each of the four directions of the Rio Grande bio-region; one to the north at the River’s source in Creede, Colorado; one to the south where the great river empties into the Gulf of Mexico; and one each on the top of the two highest mountains — Mt. Baldy to the east and Mt. Chicoma to the west. From there the vases began to go out in many directions. Each one has a story and each story is unique. Over the last 20 years, we have learned that our prayers do have power as the vases take on the energy of our offerings and intentions. They are living beings; the more we fill them, the more alive they become — filled with a sense of purpose and a mission to fulfill. As best as possible, we have followed the traditional instructions and always recall the lamas who gave us their blessing to fill them ourselves. We are grateful for how this opportunity has allowed us to connect with the practice directly, aware that if they had done it for us we never would have taken it in so deeply. We have also learned to become real participants in the work of healing and offering protection for the Earth. Motivated to become stewards of the Earth, and to share our prayers with elders, youth, shaman, masters, activists and regular folks in communities and places across the globe, we are honoring the spiritual and healing traditions of the whole Earth — not just the way of Tibetan Buddhism. Together, we are embracing the Earth in our love. In filling each vase, sometimes over many months and even years, we form a relationship to the place where it is to go and make offerings especially intended to benefit that particular area. In this way, we have come to make the practice our own. Everywhere we go, we leave the vases open in order to invite the prayers and offerings of the local indigenous people. Only when they are completely full, are the vases ceremonially sealed and then buried in such a way that they will never be disturbed. The vases have become our ambassadors, opening doors and connecting us around the world. We have seen that no matter where we are or what culture or spiritual tradition is represented, everyone can recognize that the Earth is suffering, out of balance, and in need of our prayers for protection and healing.